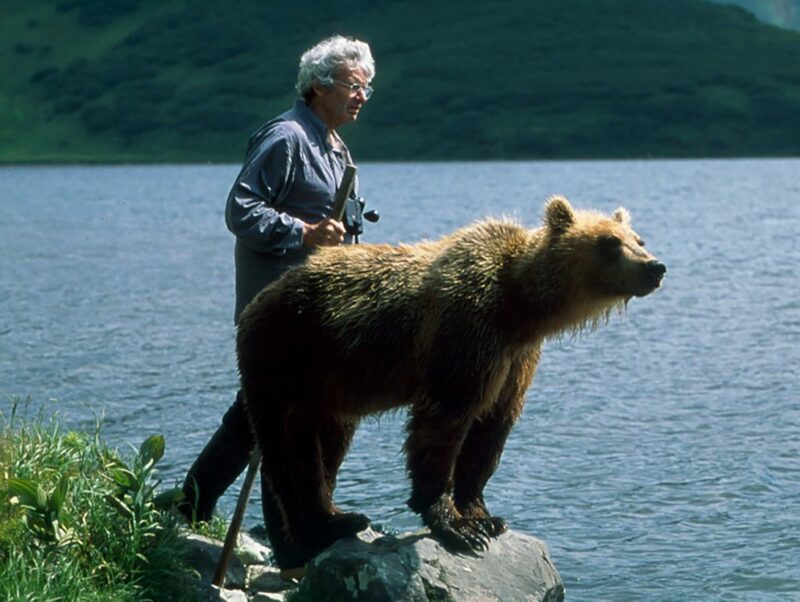 Charlie Russell in an undated photograph with a young grizzly bear at a lake on the Kamchatka Peninsula in Russia. Credit: Maureen Enns Studio Ltd. They wrote several books based on those experiences and were the subject of documentaries and countless articles. Mr. Russell’s ideas, though, were not embraced by everyone. Some fellow naturalists worried that they might lead people to be unwisely casual around wild animals. And in Russia, Mr. Russell ran afoul of criminal elements and corrupt politicians tied to bear poaching. Mr. Russell with a young grizzly. He was outspoken in his belief that the view most people held of bears was wrong. Credit: Maureen Enns Studio Ltd.
Andrew Charles Russell was born on Aug. 19, 1941, in Pincher Creek, Alberta. His parents, Andy and Kay (Riggall) Russell, ran an outfitting business; his father led guided horseback adventures into the mountains near the family ranch, trips that might last three weeks. Mr. Russell became a rancher on the family land in Alberta, and he began to wonder if the traditional rancher view of bears as an enemy was fair. Mr. Van Tighem said that Mr. Russell, who had no college education, was not interested in studying bears in the usual way. But to really get at the innate nature of bears, he needed to find ones that had no history of negative encounters with people. That is what sent him and Ms. Enns to Kamchatka, which had been off limits to civilians for military reasons during the Cold War and thus was full of bears that had had no contact with humans. The bears grew to know them, Mr. Russell said, and became comfortable enough with them that sometimes a few would come to the cabin and linger to see if he and Ms. Enns wanted to go for a walk with them. Mr. Russell said of the bear, “I believe that it’s an intelligent, social animal that is completely misunderstood.” Credit: Maureen Enns Studio Ltd.
Mr. Russell, though, had always advocated taking precautions, like carrying pepper spray or using electric fencing, and had criticized Mr. Treadwell for not doing so. Books by Mr. Russell and Ms. Enns include “Grizzly Heart: Living Without Fear Among the Brown Bears of Kamchatka” (2002) and “Grizzly Seasons: Life With the Brown Bears of Kamchatka” (2003). Mr. Russell’s marriage to Margaret Hynde ended in divorce in the early 1970s. In addition to his brothers, he is survived by a sister, Anne Raabe, and a granddaughter.